Conan the Barbarian is a 1982 American fantasy film directed by John Milius. It is based on stories by Robert E. Howard, a pulp fiction writer of the 1930s, about the adventures of the eponymous character in a fictional pre-historic world of dark magic and savagery. The film stars Arnold Schwarzenegger and James Earl Jones, and tells the story of a young barbarian (Schwarzenegger) who seeks vengeance for his parents’ death at the hands of Thulsa Doom (Jones), the sorcerer and leader of a snake cult. Buzz Feitshans and Raffaella De Laurentiis produced the film for her father Dino De Laurentiis. Basil Poledouris composed the amazing music. 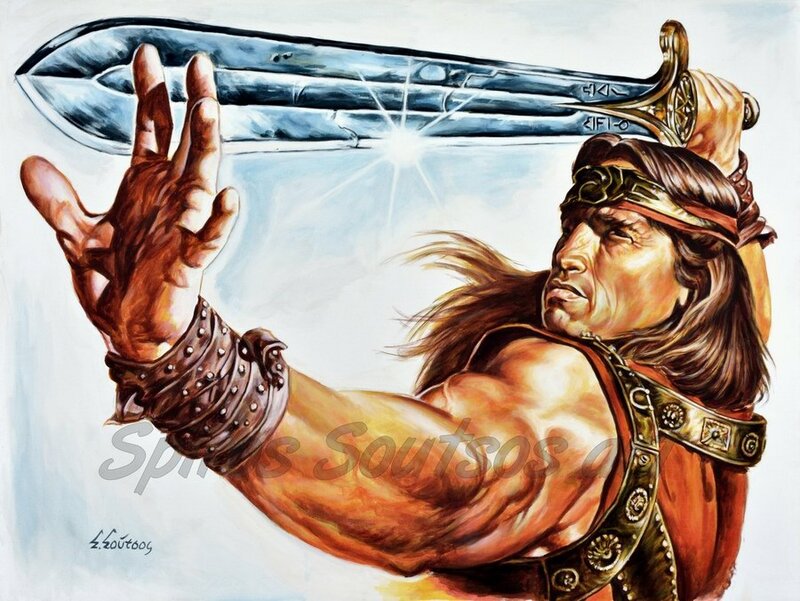 The first ideas for a Conan film were proposed in the early 70’s. An effort by executive producer Edward R. Pressman and associate producer Edward Summer to produce the film started in 1975. It took them two years to obtain the film rights, after which they recruited Arnold Schwarzenegger for the lead role and Oliver Stone to draft a script. Pressman lacked capital for the endeavor, and in 1979, after having his proposals for investments rejected by the major studios, he sold the project to Dino De Laurentiis. Milius was appointed as director and he rewrote Stone’s script. The final screenplay was inspired by Howard’s stories and by films such as Kwaidan and Seven Samurai. Filming took place in Spain over five months, in the regions around Madrid and Almería. The sets, designed by Ron Cobb, were based on Dark Age cultures and Frank Frazetta‘s paintings of Conan. Director Milius avoided optical effects, preferring to realize his ideas with mechanical constructs and optical illusions. Schwarzenegger performed most of his own stunts, and two types of swords, costing $10,000 each, were forged for his character. The editing process took over a year and several violent scenes were cut. Conan was a huge commercial success, grossing more than $100 million at box-offices around the world, although the revenue fell short of the level that would qualify the film as a blockbuster. Critics interpreted the film as advancing the themes of fascism or individualism, and the fascist angle featured in most of the criticisms of the film. Critics also negatively reviewed Schwarzenegger’s acting and the film’s violent scenes. Despite the criticisms, Conan was popular with young males. The film earned Schwarzenegger worldwide recognition. Conan has been frequently released on home media, the sales of which had increased the film’s gross to more than $300 million by 2007. The film’s popularity led to the 1984 sequel Conan the Destroyer.